With the LA4, Fame audio introduces a professional PA system based on the latest line array technology. Due to their special characteristics, line array systems have become widely accepted in the professional PA sector. The main advantage of this technology is its higher range. This results from the focused, denser sound development of the individual speaker modules. 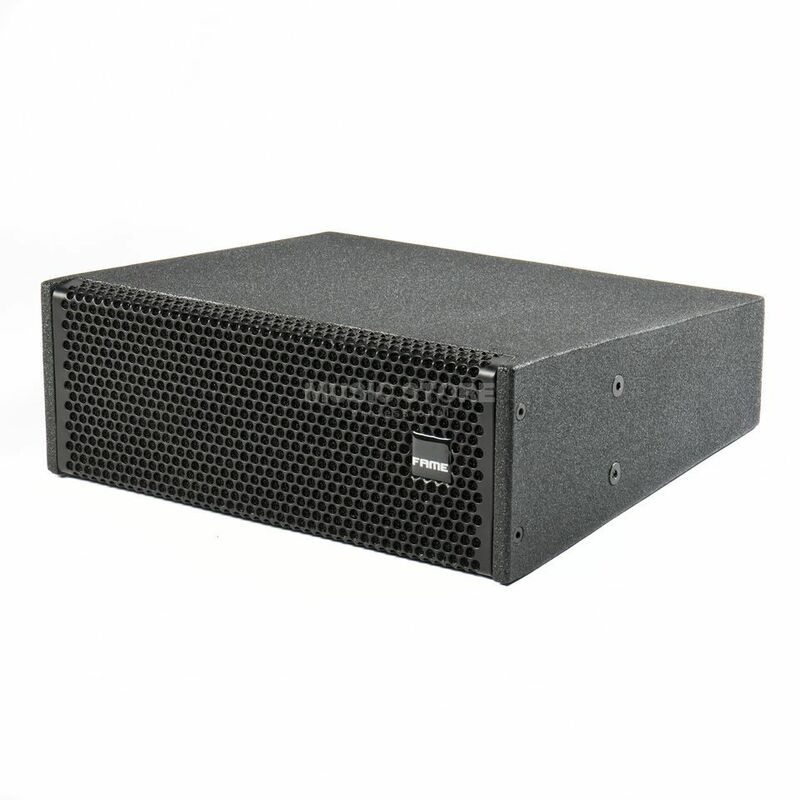 For example, the individual Fame audio LA4 Line Array modules have an optimized radiation pattern of 90°x90°. The sound is therefore emitted in a more targeted area, and thus also carries much more sound pressure than conventional loudspeaker systems with very wide beam angles could achieve. The disadvantage of being able to direct only a very narrow focus is compensated for in line array systems by the fact that several speaker modules are used in parallel. A complete Fame audio LA4 line array system consists of one active LA4-15A subwoofer, one active LA4A line array module and a second passive LA4P, which is powered by the amplifier unit of the active LA4A. The modules are mechanically connected to the LA 4 tripod adapter, which can either be mounted on conventional loudspeaker stands, such as the BOX10 with pneumatic lift, or can be used in combination with distance rods, such as the SAT10, which is also equipped with pneumatic components. Fame audio LA 4 Line Array PA systems are offered in two sets, mono and stereo. With the individual active and passive modules, an existing system can be supplemented with additional mid-high range speakers. Fame Audio's compact and passive LA 4P loudspeaker is a special addition to the LA4 Mini Line Array System. The array module can not only be easily attached to the optional tripod adapter (LA4 tripod adapter), but also impresses with its performance and simple design. 160 Watt RMS (350 Watt peak) the mid/high speaker produces a maximum sound pressure of 160 Watt RMS 112 dB SPL! The Line Array's typical optimized coverage of 100°x90° per module achieves a very high range, which guarantees a present audio performance even over longer distances, while the two 4" woofer drivers as well as the 1" tweeter ensure a clear, but powerful reproduction with wide frequency response (105Hz - 17KHz) - thus Fame proves that size alone is not everything! The Speakon connectors also ensure fast and secure wiring. The robust housing and above all the low weight of only 6kg round off the LA4P speaker's overall appearance! However, those who prefer an active version are well served with the LA4A. Click here for the matching LA 4-15A Subwoofer!